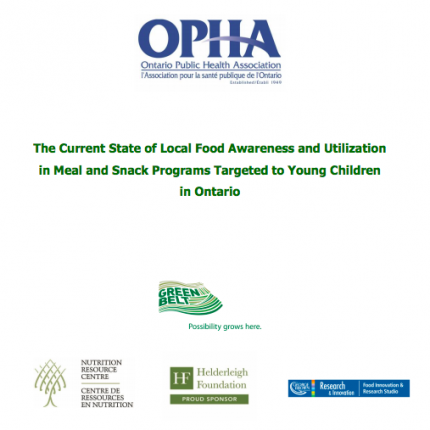 The Nutrition Resource Centre (NRC) at the Ontario Public Health Association (OPHA) has collaborated with the Greenbelt Fund on a research project, in partnership with the Food Innovation & Research Studio (FIRSt) at George Brown College (GBC) and the Helderleigh Foundation, which has just released its final report: The Current State of Local Food Awareness and Utilization in Meal and Snack Programs Targeted to Young Children in Ontario. Project advisors were from Ontario Dietitians in Public Health, the Ontario Federation of Agriculture and Sustain Ontario. The Nutrition Resource Centre is planning a webinar in the near future to discuss and share these results. Stay tuned.